However, figures show the trade surplus has increased to €3.2 billion in the year with the agri-sector performing strongly. 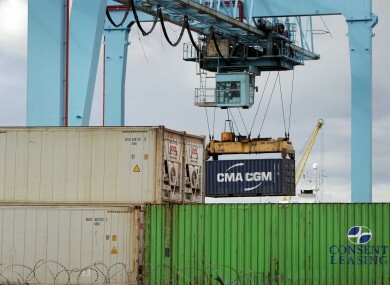 EXPORTS FROM IRELAND dipped in July, new figures from the CSO have revealed today. Comparing the month with the corresponding period last year, exports decreased by €209 million to €7.6 billion. This was mainly attributed to a 13 per cent fall in the export of medical and pharmaceutical products. But that was somewhat offset by a €101 million increase in the sale to foreign markets of food and live animals. There was also a €105 million increase in imports in the same period, closing the trade surplus to €3.695 billion (down more than 7 per cent in the year). There was a 3 per cent climb in exports in the month, however, pushing the figure up €184 million from June. Seasonally-adjusted imports decreased by €61 million to €4.1 billion resulting in an 8 per cent increase in the seasonally adjusted trade surplus to €3.2 billion. The EU accounted for more than half of all exports in the month of July, while the USA remained the main destination outside the bloc, accounting for about 18 per cent of total exports. Email “Ireland sees drop in exports during July”. Feedback on “Ireland sees drop in exports during July”.